After much testing and tasting, we have come up with several definitive lavender tea blends using our own organically-grown "Provence" culinary lavender. Our Organic Lavender White Peony Tea, a special varietal Chinese tea (named for its grey white leaves covered with a velvet peach fuzz down) is naturally sun-dried, and is increasingly being recognized for its antioxidant properties. 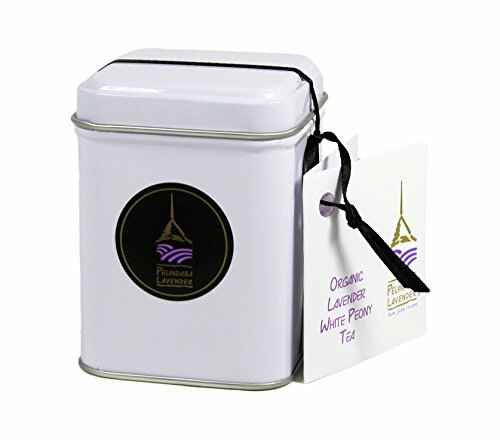 We blend this organic Pai Mu Tan white tea with our organically-grown culinary lavender to produce another wonderfully healthy and delightfully aromatic beverage unique to Pelindaba. Whatever your preference, these exquisite lavender tea blends are stress-relieving and wonderfully refreshing, iced or traditionally hot, and especially when sweetened with Pelindaba Lavender Gourmet Honey. If you have any questions about this product by Pelindaba Lavender, contact us by completing and submitting the form below. If you are looking for a specif part number, please include it with your message.